Hasui - Woodblock Print and Watercolor. Preparatory watercolor for a Hasui print. Appraisal and the value of Hasui's prints. Kawase Hasui - A watercolor, a preliminary painting for Hasui's woodblock print: A Tea Plantation Higashi Agano, Saitama, 1941. Kawase Hasui - An original watercolor. A preparatory watercolor for a woodblock print. Free Appraisal and Valuation of Hasui's Prints (get values and prices). Kawase Hasui (1883-1957)(川瀬 巴水) - Higashi Agano, Saitama. A tea plantation. Bushu (Saitama) Higashi Agano, watercolor, preparatory work for woodblock print published 1941. See Kendall H. Brown - Kawase Hasui, The Complete Woodblock Prints, 2003, Amsterdam, Vol. 2, p. 521, pl. 456. Most of Hasui's prints seem to be based on atmospheric and beautiful watercolors. These were most probably done on location, however, this needs more research. There exist pencil drawings in sketchbooks, which seems to be preparatory sketches either for the watercolours and/or the prints; again it is very difficult to say if these are done on the actual location. The creative process of Hasui seems shrouded in mystery, and at the moment is mostly anecdotal in nature and very little is known by substantiated facts. There is a short movie (see below) of Hasui making a pencil and watercolor preparatory sketch for a print. Many of Hasui's watercolors seem to have been done within a year or two of the print, however, in some cases there seems to have been decades between the original work and the print version. Most often the preparatory work for a Japanese print was a line drawing. Hasui and most other Shinhanga artist used the "boneless" style of woodblock print so most likely most preparatory works were actual paintings. Hasui's watercolors are highly sought after and valued by both Japanese institutions and collectors as well as their Western counterparts. 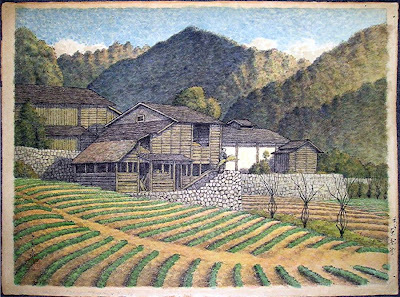 In the present watercolor Hasui uses an almost pointillistic technique in applying the watercolors. This is especially noticeable on the tea bushes were this watercolor technique helps to render depth and three dimensionalities as well depicting the foliage the tea bushes in a natural way. Medium: Watercolour on Japanese watercolour paper. Condition: Fine color condition, unfaded. The paper is very slightly toned, a bit more towards the edges, especially on the extreme end of the deckle edges. Size: The present watercolour is done on a daioban-sized paper. 55.6 x 40.5 cm. 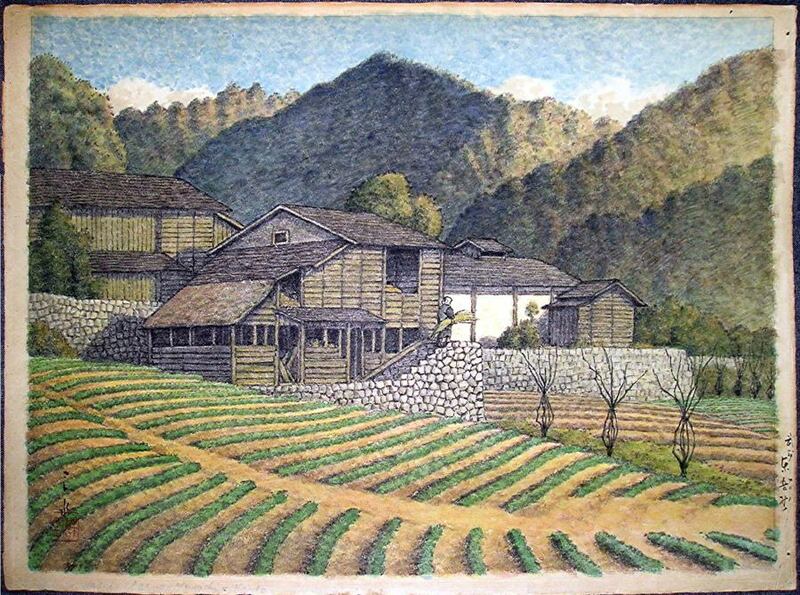 Provenance: A private family of art collectors, Japan, acquired directly from Hasui. The original owner acquired this watercolour directly from Hasui. We bought the watercolour directly from a representative of the original "art collector family". Many of the "Hasui" watercolours on the market are "production" watercolors of a quality and lack of professional technique which makes us question to as if these are just very sloppy work by Hasui or even if they could have been executed by craftsmen in the woodcarving/printing workshop or some "student" of Hasui. The above watercolour is of superb technique and conception. Coupled with the direct acquisition from Hasui, rather than one of the publishers, it is a work with absolute certainty to be autograph by Hasui. A movie featuring Hasui preparing sketches for a woodblock print and the master-carver Maeda Kentaro carving the woodblocks. Click the four arrows full-screen symbol, in the lower right corner, after the movie starts, this will give you a full-screen window. Due to the bad quality of the movie, this is almost necessary. Press the esc key (escape) to get out of full-screen mode. The movie about Kawase Hasui has been supplied by the publisher Brill (under their Hotei brand), who published the complete catalog of Hasui's woodblock prints. The "complete" catalog is unfortunately not as complete as would be wished for, as many if not most of the rare/ very rare non-export designs are missing. However, this is to some extent understandable as many of the non-export prints are ephemeral and extremely rare. We have a large selection of high quality early Hasui prints ("pre-earthquake"). Don't hesitate to contact us! Recently there are many "new" collectors and museums who are trying to buy Hasui's woodblock prints and watercolors. The prices of Hasui's best watercolours have become more expensive, also Hasui's best woodblock prints are experiencing a price rise. The value of Hasui's prints shows some movement upward after being depressed for more than a decade and a half.